A Golf Classic in aid of Solas Bhride Centre will be held in the K Club (Smurfit Course), Straffan, Co. Kildare on Monday, May 15th. Since the official opening we have welcomed over 16,000 pilgrims/visitors to the Centre and the bookings are steadily growing for this year. The response from all who come, local, national and international is hugely positive. 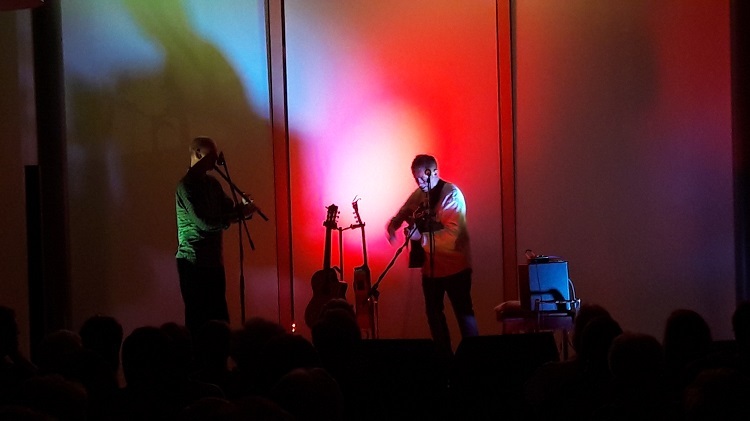 We are delighted that the Centre is benefiting the local area financially, culturally, educationally, and is also enhancing the commercial infrastructure of town and county. The building has been completed but we are still in need of financial support for the ongoing development and maintenance of the Centre and its grounds. We would welcome your support by entering a team. Simply email info@solasbhride.ie or phone 045 522890. If you are a non golfer perhaps you would get your friends to enter a team, or you may wish to sponsor a tee box. All the above bookings are private events or bookings made through group organiser. 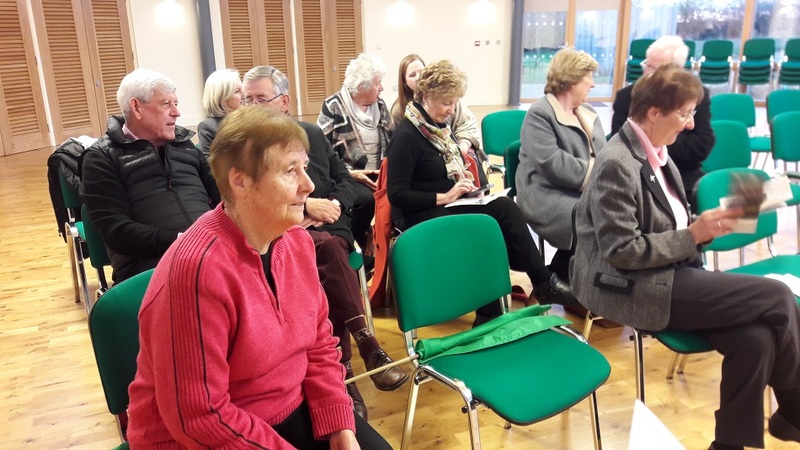 Trocaire held a workshop on Climate Change at the Centre. 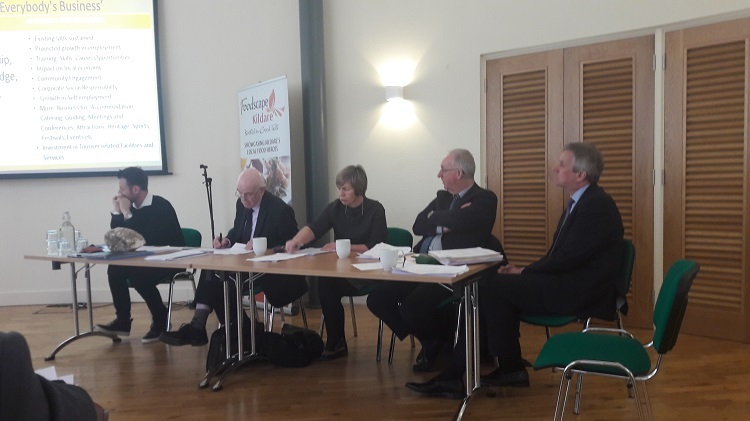 This was attended by representatives of five local schools. The children learned about the need to care for the environment and the problems caused by climate change, leading to changes in weather patterns which results in droughts in some parts of the world and flooding in others. In one of the exercises they had to identify the creatures that were in danger of extinction. 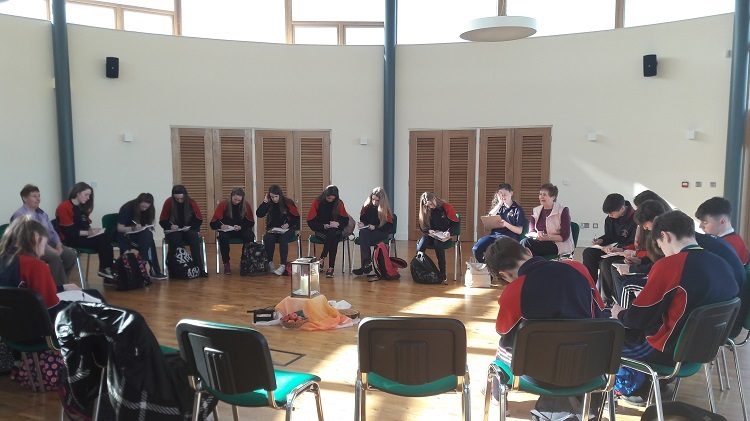 One of the questions Junior Cert students had to research for their upcoming exam was to visit a faith community and identify how it lives out its mission. 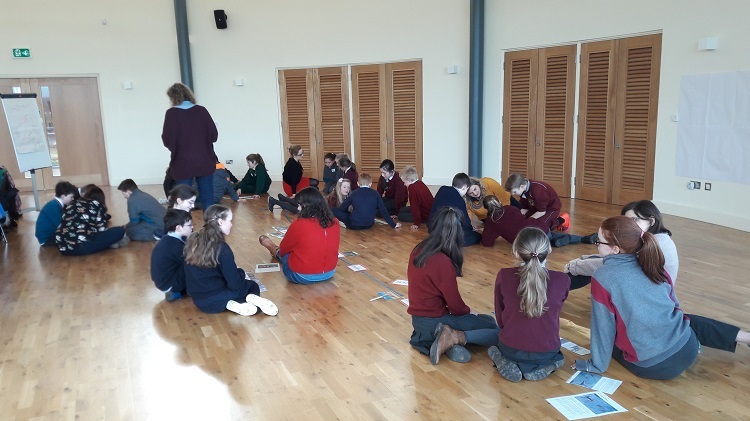 The students from Mountrath Community School spent a day at Solas Bhride, interviewing the community and finding out how the legacy of St. Brigid is so relevant today. Solas Bhride team facilitated nine confirmation retreats. The days were part of their preparation programme for Confirmation. The students spoke of their day at the Centre as being very relaxing, peaceful and enjoyable. 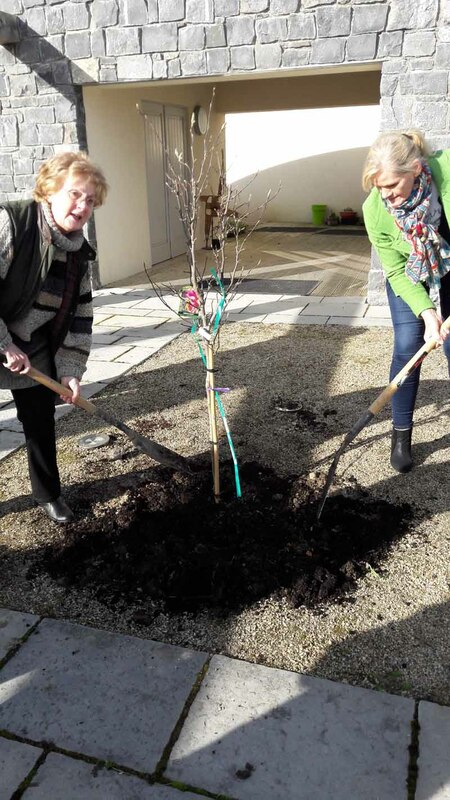 Two oak saplings planted at the entrance to Solas Bhride were transplanted recently. 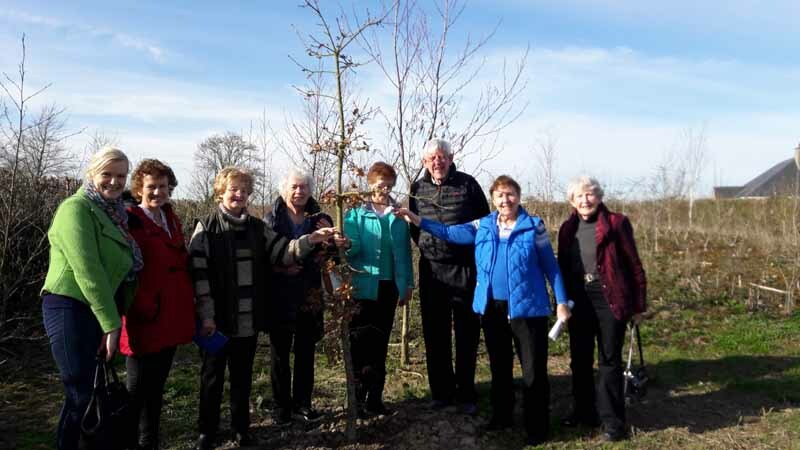 The oak saplings were nurtured from acorns taken from the oak tree planted in Tullow in Co. Carolw by Bishop Daniel Delany in 1807 when establishing the Congregation of the Sisters of St. Brigid. (Brigidine). 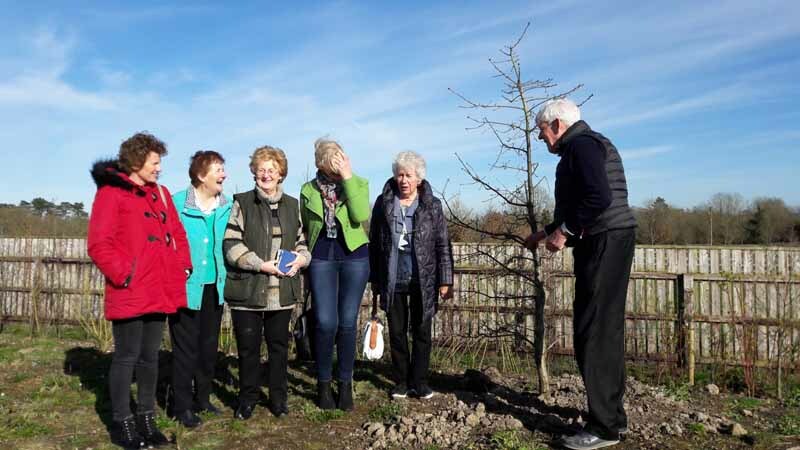 These oaks were planted by Rita Minehan csb and Brenda Kindregran of Cairde Bhride. The courtyard area was not a suitable location for the little oaks to flourish. Hopefully, they will be able to stretch their limbs in their new location on the grounds. In their places two beautiful Magnolia trees were planted. 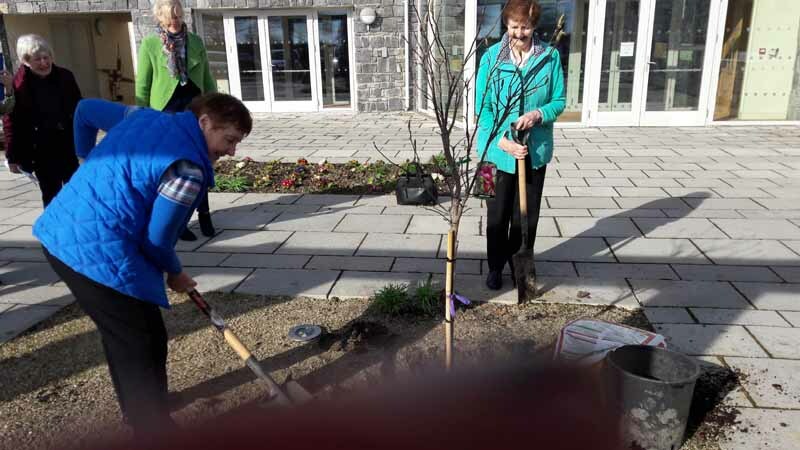 The trees were a gift from Cairde Bhride, to commemorate 25 years of the presence of the Brigidine Sisters in Kildare and the re-lighting of the Brigid Flame. The magnolias are blossoming in their new home. 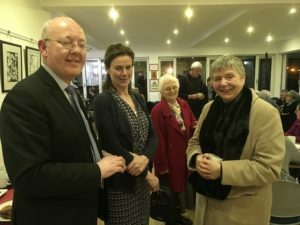 The AGM of Kildare Failte took place at Solas Bhride on March 22nd. The AGM highlighted another very successful year for tourism in County Kildare. In early 2016 Failte Ireland introduced “Ireland’s Ancient East”, a brand for promoting tourism in the East. 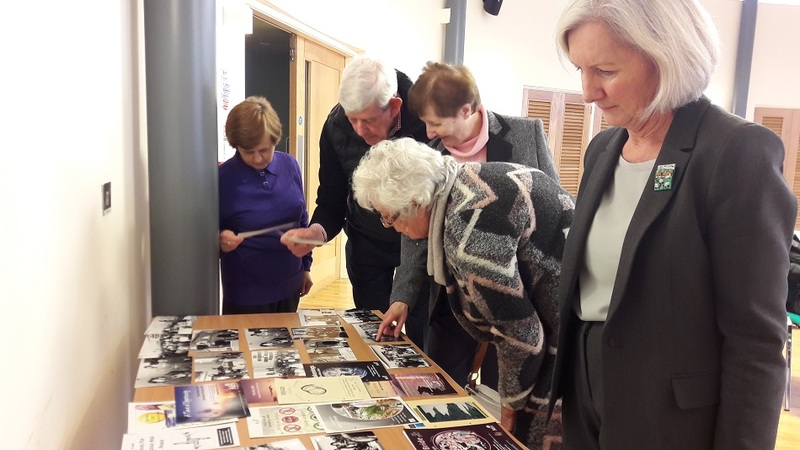 County Kildare Failte have drawn up a Tourism Strategy for the County to enhance, grow and sustain all aspects of tourism and its sectors in County Kildare. The plant will be launched in April 2017. Rita and Phil were invited to share the Solas Bhride story. Solas Bhride was the venue for a Master Composter Training course hosted by Kildare County Council. 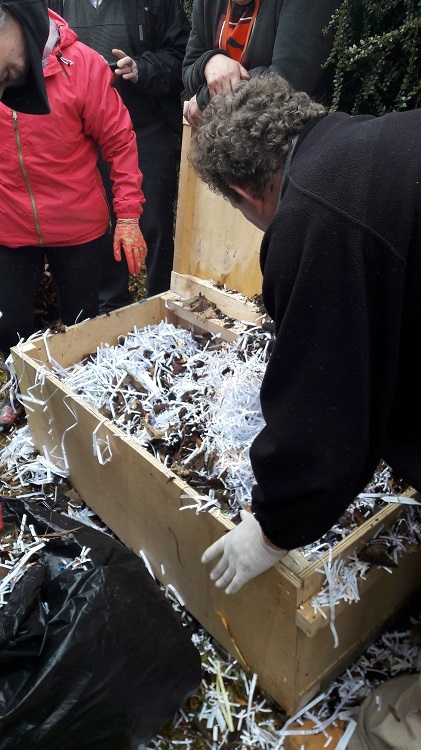 The Composting Course is part of a national programme aimed at the prevention of food and garden waste and the promotion of home composting. The STOP Food Waste progamme, which is part of the EPA National Waste Prevention Programme, is run by a collaboratie team with a diverse experience in waste prevention and composting. 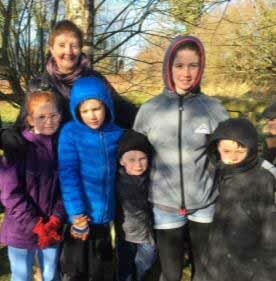 Nuala Madigan, Irish Peatland Conversation Council’s Environmental Education Officer facilitated the course. 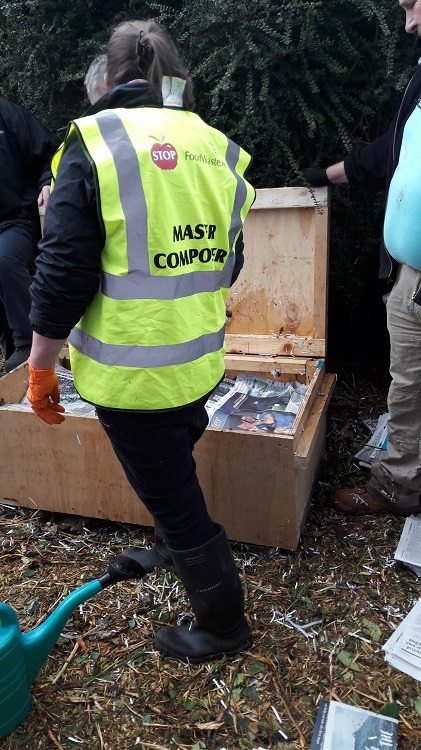 The goal of the course, as well as raising awareness of food generation and prevention of waste, was to give a thorough education about all parts of composting. 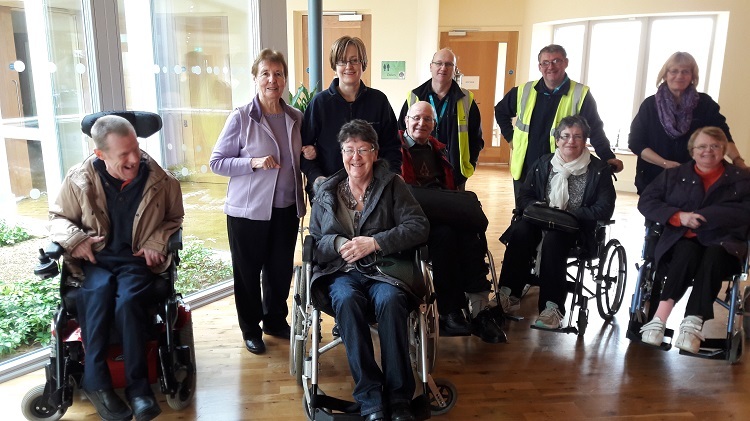 Part of the course involved a visit to the Home Composting Demonstration site in the grounds of Kildare Housing Association. Participants helped in the setting up of compost holding units and turning systems as well as a wormery. Australian visitors Gail and Fran enjoying Feile Bride. Solas Bhride Team and Cairde Bhride celebrate together after a successful Feile. 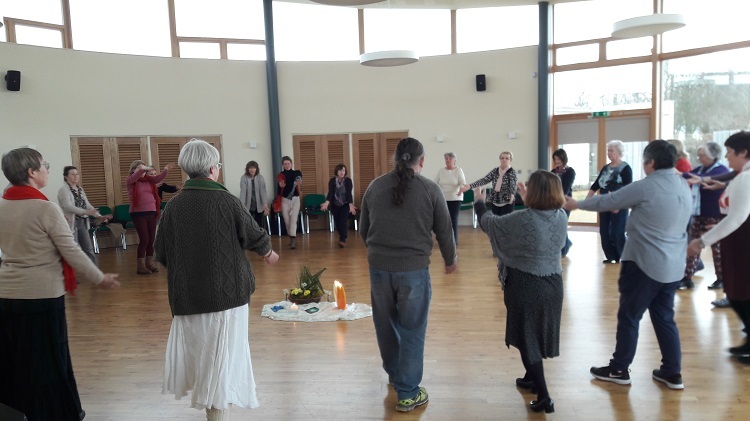 Participants enjoying learning about the Traditions and Customs associated with St. Brigid and the celebration of St. Brigid's Day. 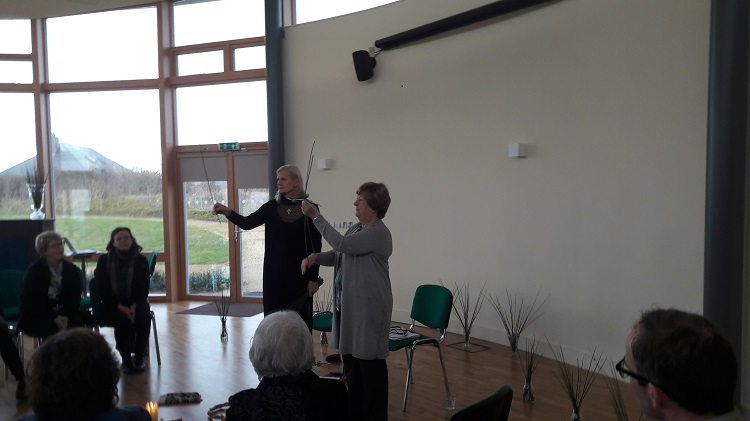 Sacred Dance Workshop, facilitated by Terry Hennesy, proved a popular event at the Feile. 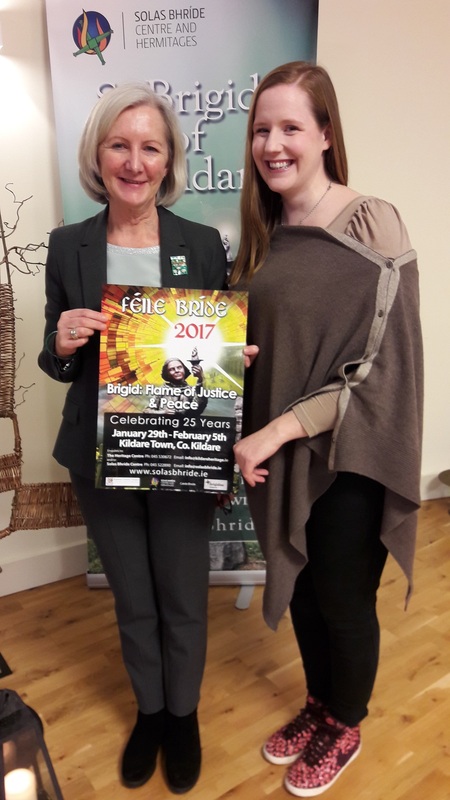 The theme of the Feile, "Brigid: Flame of Justice and Peace", and significant moments during the past 25th years of Feile Bride was celebrated through dance. 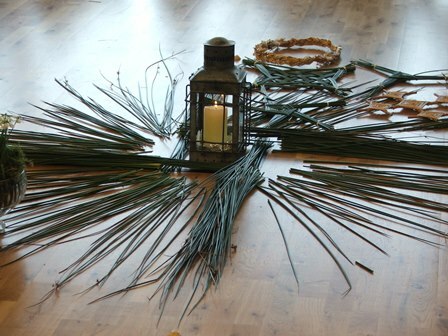 The tradition of weaving St. Brigid’s crosses on Brigid’s eve is very much part of Feile Bride. 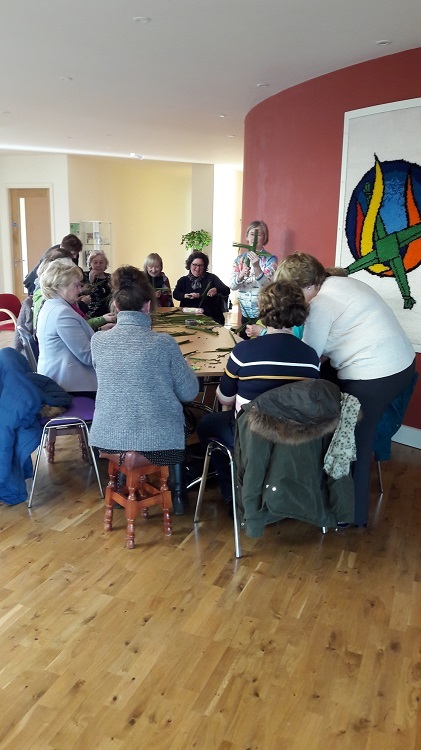 The Solas Bhride Centre was a hive of activity early on the morning of Brigid’s Eve as many came to learn the art of weaving the cross, or in many cases to relearn, having made crosses as children. Some were weaving crosses for the first time, visitors from England, USA, Australia and Germany. All proudly displayed their completed crosses at the end of the morning. Susan and Judith Boyle held a delightful evening of storytelling on the theme of “Brigid and the Brehon Laws”. 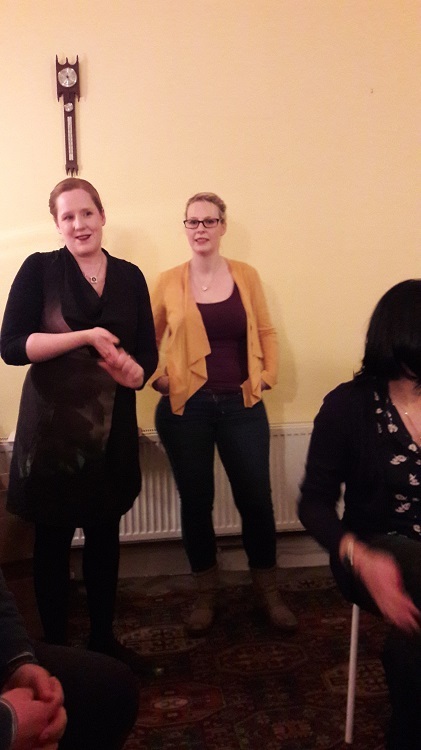 They gave an overview of the Brehon laws and all participants were treated to a tasting of the food and drink that they protected and influenced. At the start of the evening all were treated to a glass of “Brigid’s Ale”, a craft beer brewed by Susan and Judith and now sold at their pub in the Market Square, Kildare town. 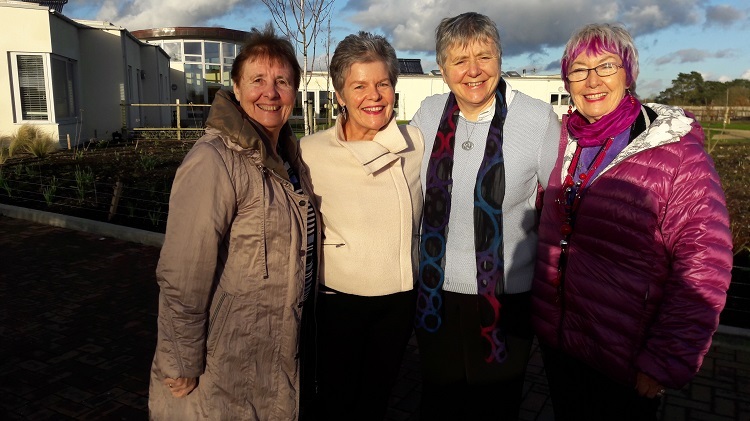 Twenty-five years of Féile Bríde festival came to a close with the celebration of Eucharist at St Brigid’s Garden Well. 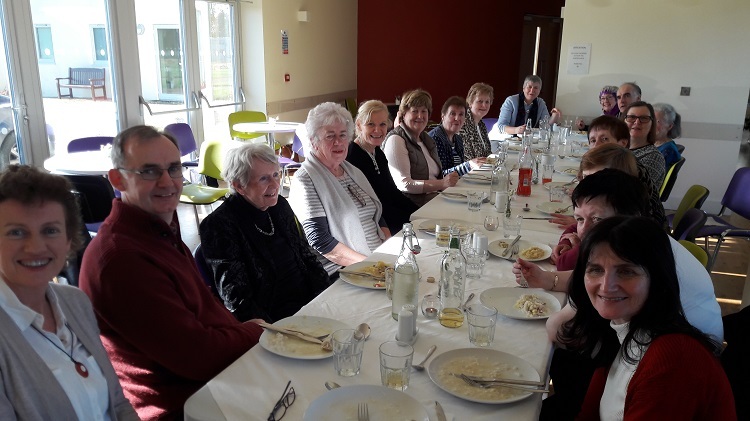 Celebrant Fr Adrian Carbery, paid special tribute to Brigidines, thanking them for their presence, hospitality and keeping the ‘flame of Brigid’ alive, not only in Kildare but far beyond. Among the pilgrims at the Well for Mass were family of Sister Alacoque Miller, a pioneering Brigidine to Australia. 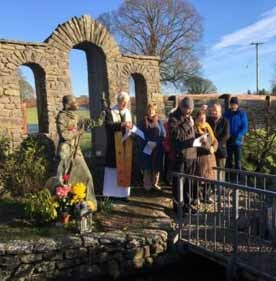 Féile Bríde began with the pilgrimage on the eve of Brigid’s day, as some 400 people gathered round the fire before setting out to walk the pilgrim route to St Brigid’s Garden Wells; praying, singing, chanting, led by Deirdre Ní Chinneide. 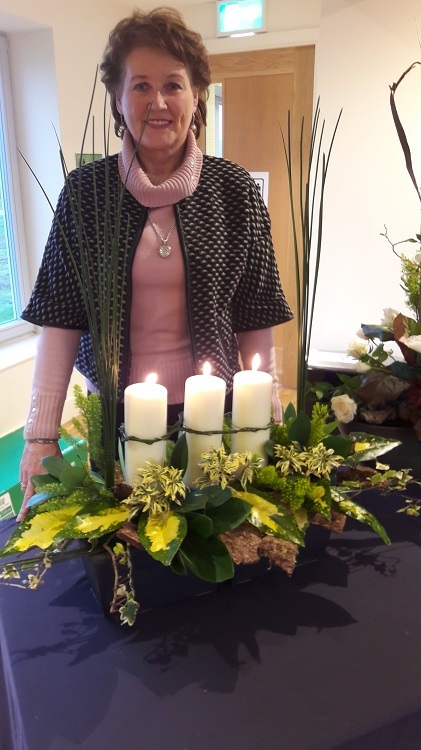 Martine (Cairde Bhríde) wove the St Brigid’s cross as she turned to the four corners of the Earth - East, South, West and North - to include all humanity and all creation in the weaving. 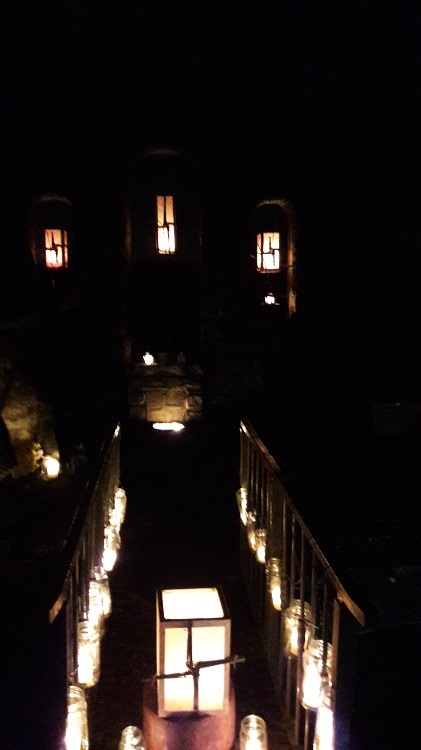 Lifted high, the cross and Brigid’s light led the pilgrims with lights and lanterns. 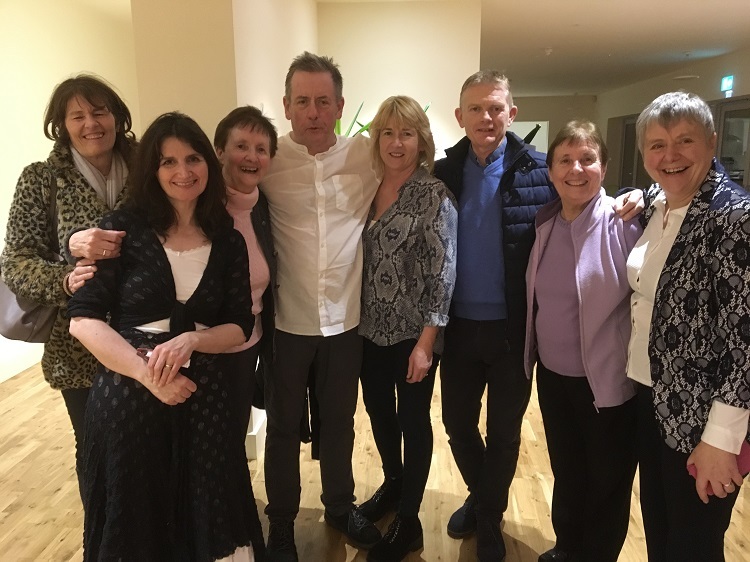 Throughout the week, many interesting activities were woven into the programme: including Luka Bloom concert ‘Let your Light shine,’’ a monastic tour of Kildare, Floral art depicting the life of Solas Bhríde, poetry- readings, writers group, sacred dance, and weaving Brigid’s cross. 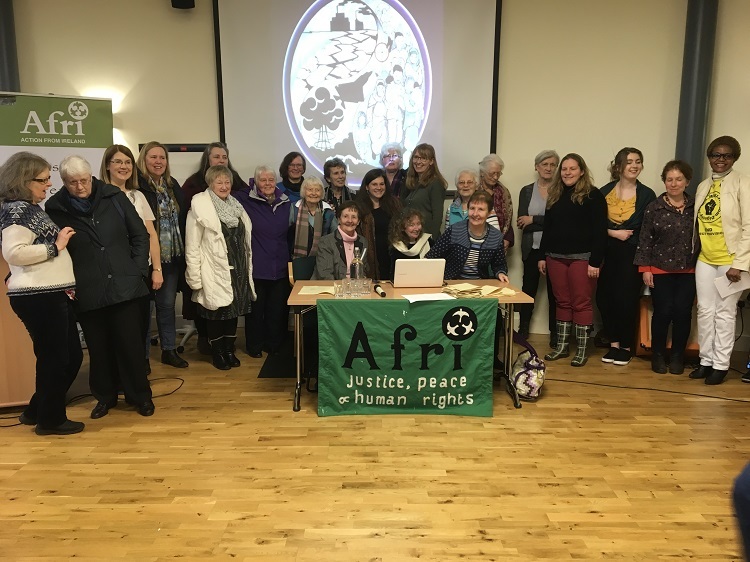 Joe Murray (Coordinator of Afri) and Sister Rita Minehan introduced the conference theme ‘Darkness to Light’ and welcomed distinguished speakers to the 25th Afri Justice and Peace conference, begun when Sister Mary Teresa Cullen lit the flame in 1993 at the first Feile Bríde. 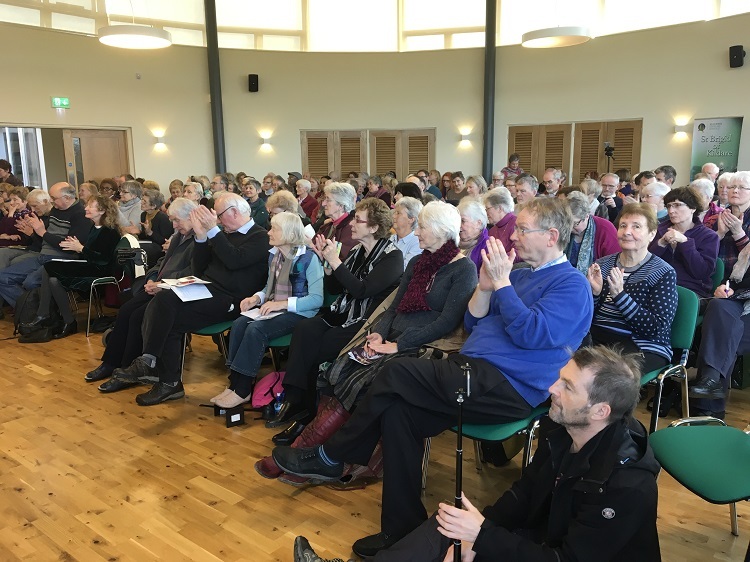 Dr Alastair McIntosh, PhD, writer, speaker, broadcaster, activist, on the theme ‘Turn back the Streams of War’ stressed the importance of learning the meaning and power of non-violence and to have a deep commitment to it. He praised the leadership of Pope Francis for his Nonviolence: a Style of Politics for Peace, written in 2017 for the 50th World Day of Peace. Kathy Kelly on ‘Other lands have dreams too’ said, quoting author Arundhati Roy, "Another world is not only possible, it is on her way. On a quiet day, I can hear her breathing." 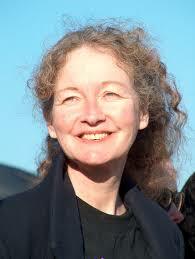 Cathy is a USA peace activist, author and founding member of Voices for Creative Nonviolence (www.vcnv.org). Cathy’s spoke of the ‘killing machine’ of the US, where troops are replaced by drones. The challenge to all is to experience the suffering and allow it to turn faith into action. 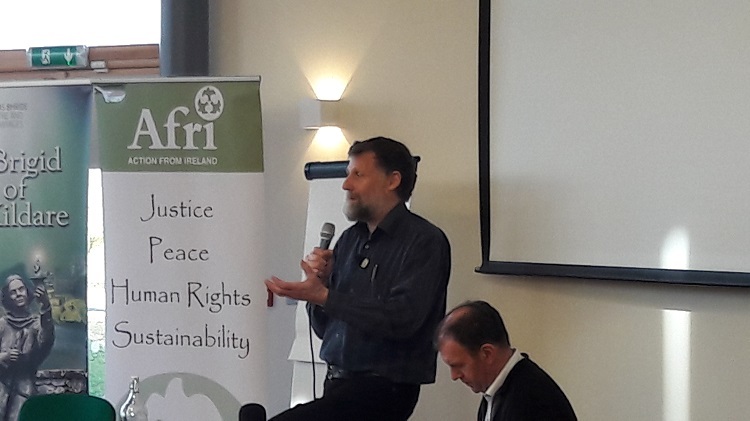 Joe Murray (Coordinator of Afri) concluded the conference by thanking all present for support. 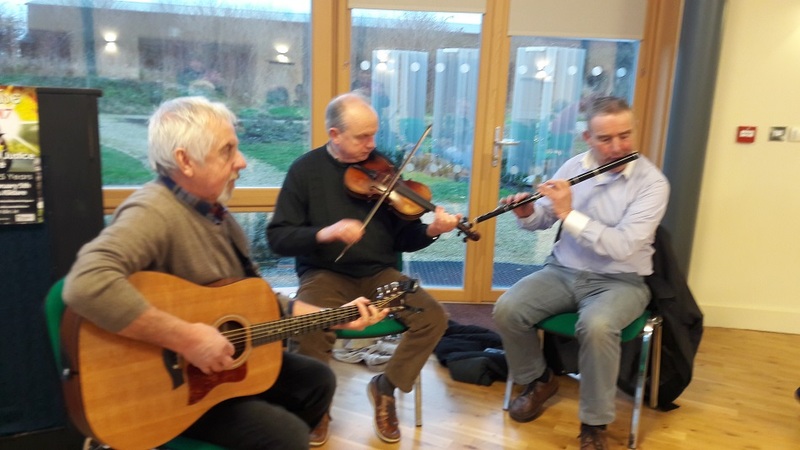 Special thanks to Solas Bhríde Centre, Cairde Bhríde and organisers of events, set-up, hospitality, catering. And to sponsors of the conference, including the Missionary Society of Saint Patrick (Kiltegan). The day ended with traditional Celtic music. Images from the official launch of Feile Bride 2017, which took place on Thursday, January 19th at Solas Bhride. Celine Broughal, Kildare Town Library and Susan Boyle, Boyle's, Market Square at the Launch. Both will be hosting events during the Feile. People gathering for the Launch take time to review the programme.